The Architects Golf Club is perennially ranked as one of New Jersey's top public golf courses, wedding venues and banquet facilities. Acclaimed sources include Golf Magazine, GolfWeek and Golf Digest. 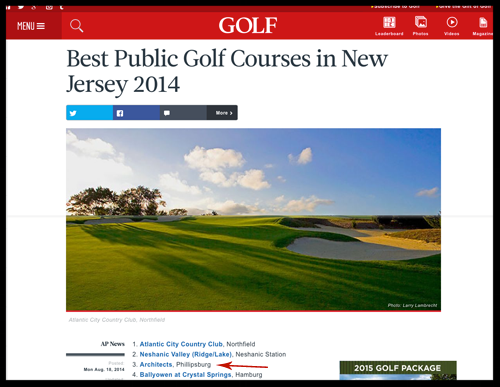 Most recently in 2016, Architects was ranked the #7, Best Public Golf Courses in New Jersey. In additional to golf accolades, The Architects Golf Club is one of Northern New Jersey & Eastern Pennsylvania's premier wedding venues and banquet facilities. We've been awarded the 2016 & 2017 "Couples Choice Awards" by WeddingWire.com. The Couples' Choice Awards recognize the top 5% of wedding professionals nationwide. We're extremely proud to have this distinguished honor two years in a row! "The conceit: Each hole is fashioned in the style of a classic designer (Banks, Ross, Tillinghast, et al). “The course flows together in a way that a golfer unaware of the concept might not even notice,” says panelist Harry Goett approvingly. Architects also breaks you in gently, with two medium-length par-5s: straightforward, 509-yard, pot-bunkered No. 1, in the manner of Old Tom Morris, and strategy-filled, 521-yard No. 3, patterned after Hugh Wilson. Goett favors yet another par-5, No. 13, on which a creek fronts the green—as it does at Alister MacKenzie’s 13th at Augusta National. Except you can’t play the Masters at these rates: a reasonable $99 on weekends." "I have coached for 29 years, have been to over 75 tournaments with my teams at courses and facilities of all stamps. Today's experience ranks among the finest I have seen over the three decades and I wanted you to know that we appreciated how well the day went. Thank you and thank you to all the staff that made it possible!"